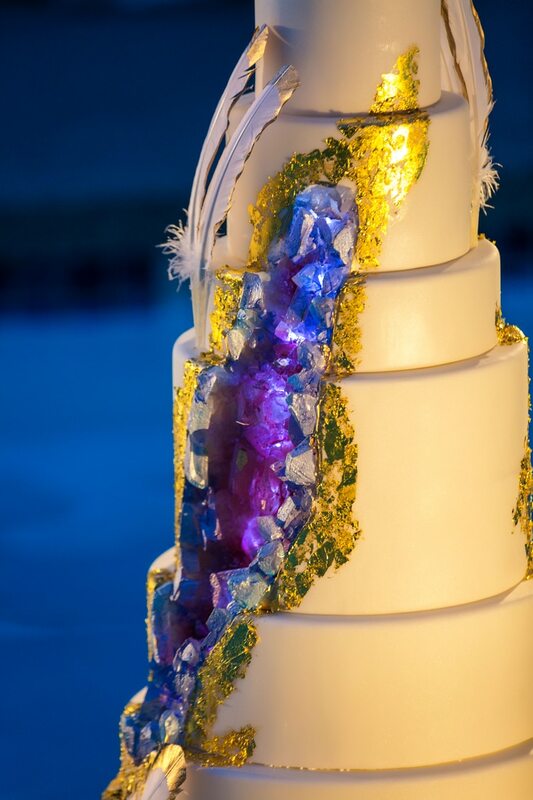 You know it’s gonna be an amazing wedding when you hear not only that it’s in Vegas, but that there’s also a floating geode wedding cake and mermaids involved! 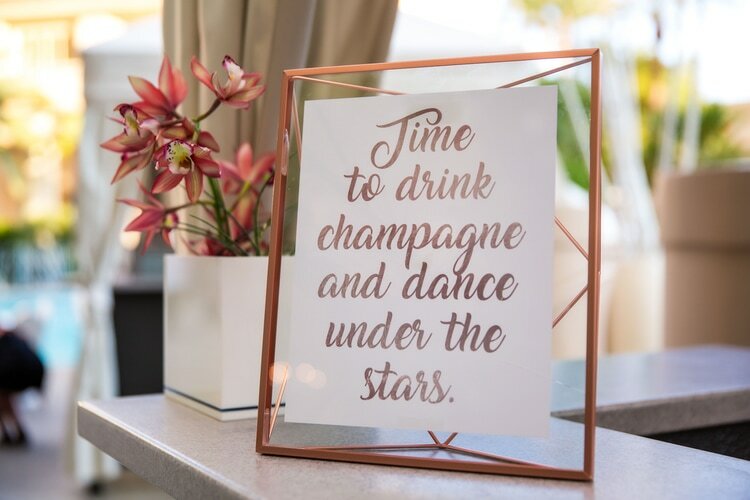 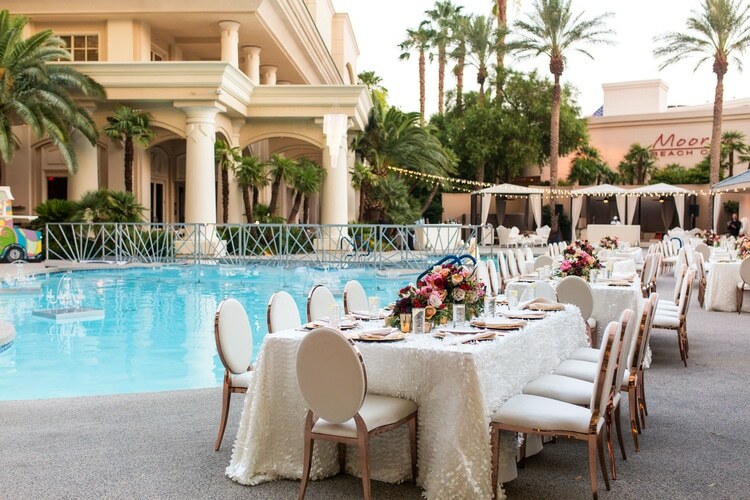 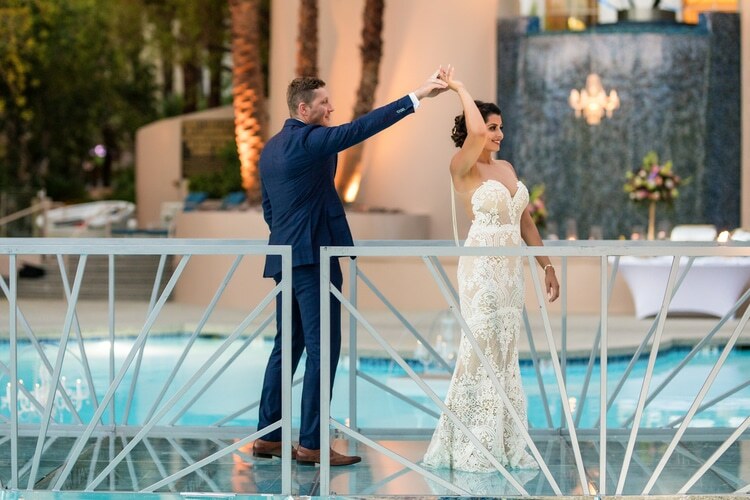 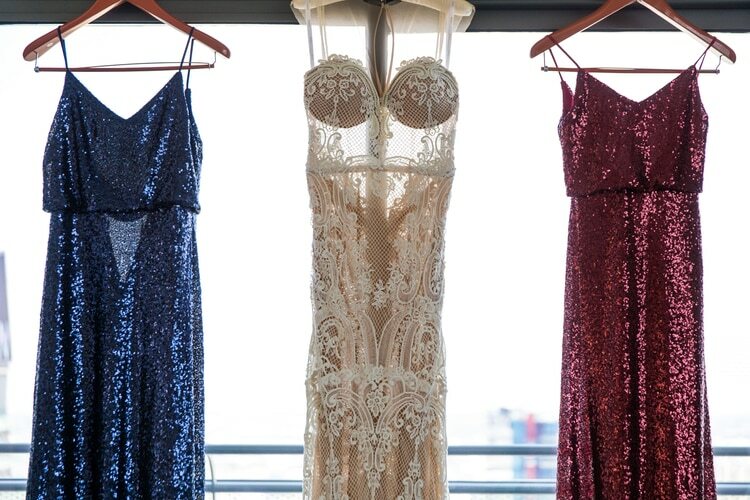 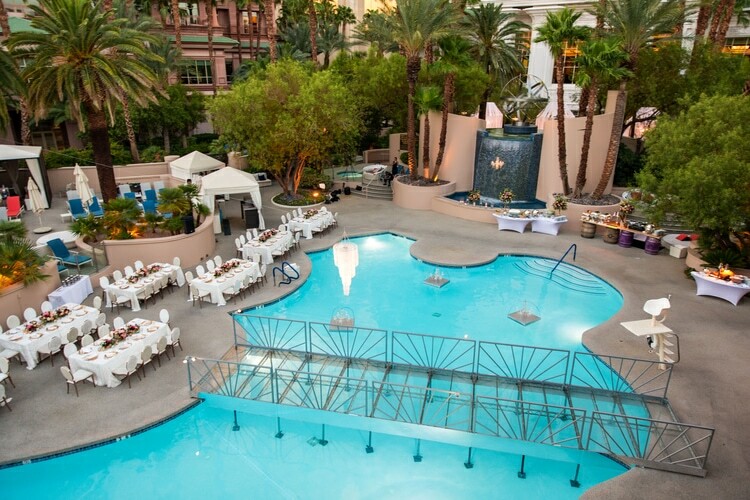 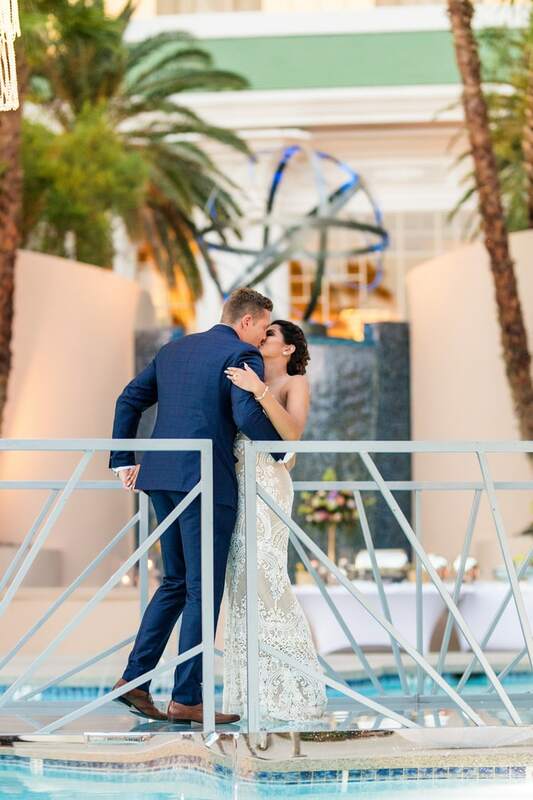 Complete with white and gold velvet chairs, edible cocktails and a flower dripped chandelier, this las vegas destination wedding was nothing short of spectacular. 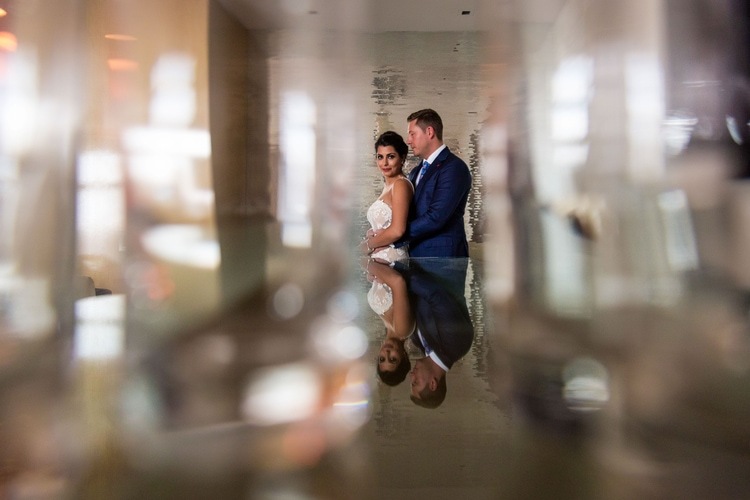 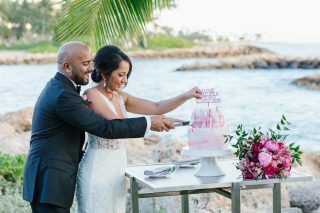 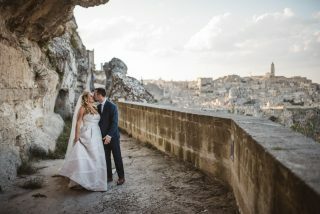 Joti and Field put all their trust in their planner, Andrea Eppolito, who had a larger than life vision for their destination wedding. 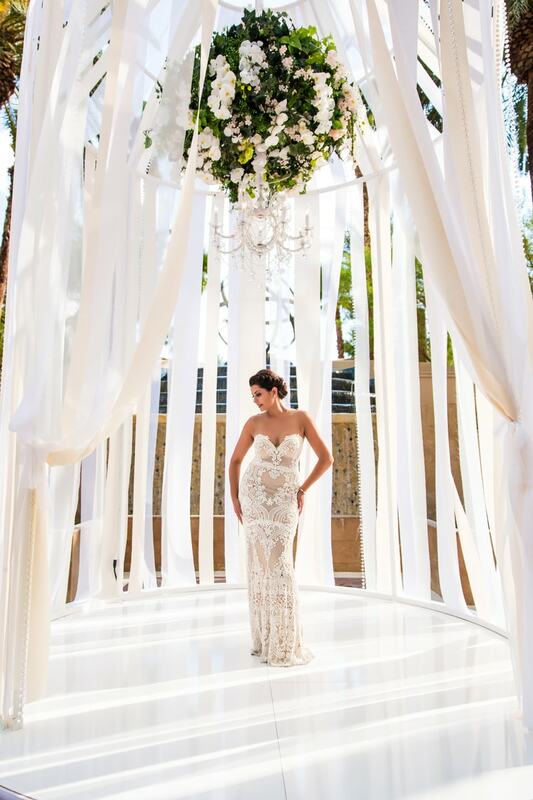 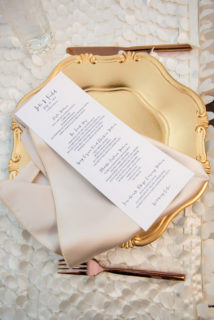 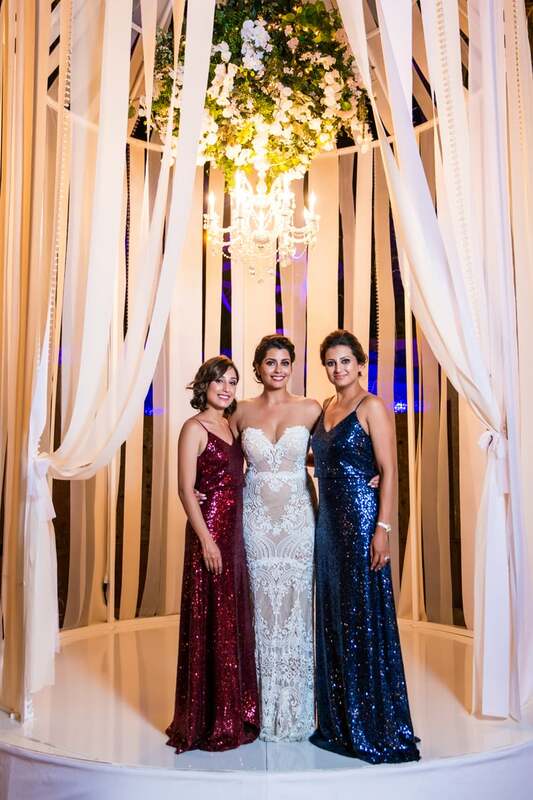 Together with a talented group of vendors, she spent over a year planning and executing every detail to perfection. 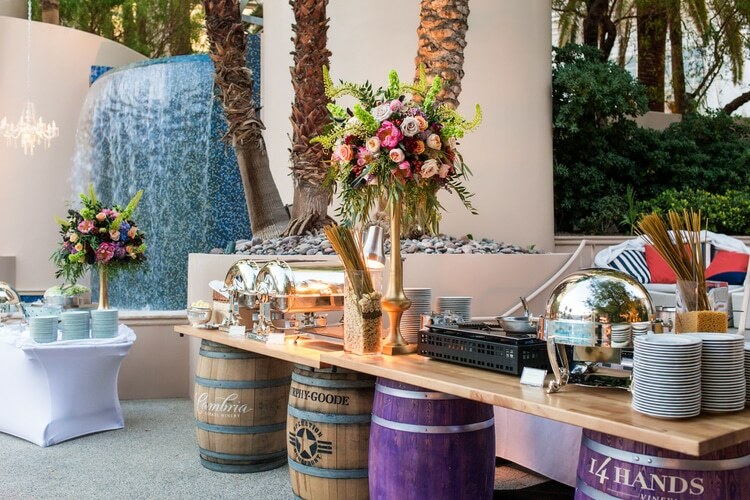 To kick off the big day, Joti and Field decided to host a cocktail hour right before their ceremony. 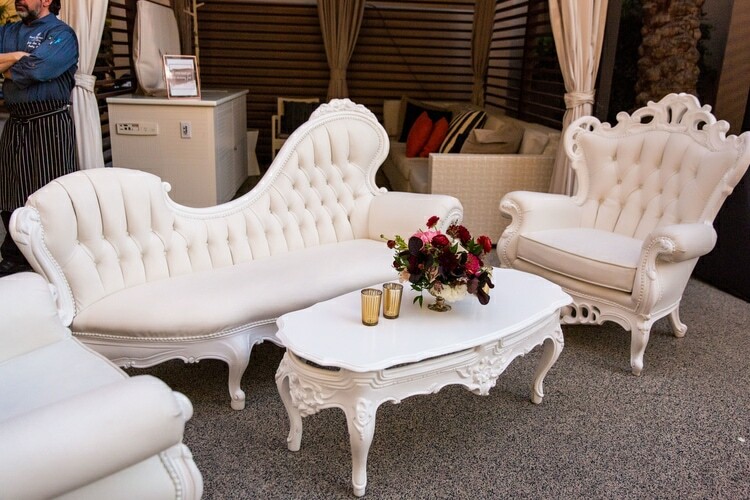 Isn’t that cool? 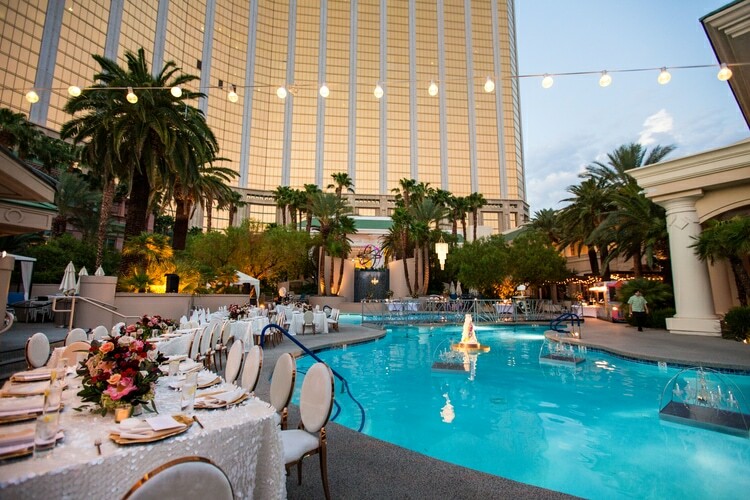 So Vegas! 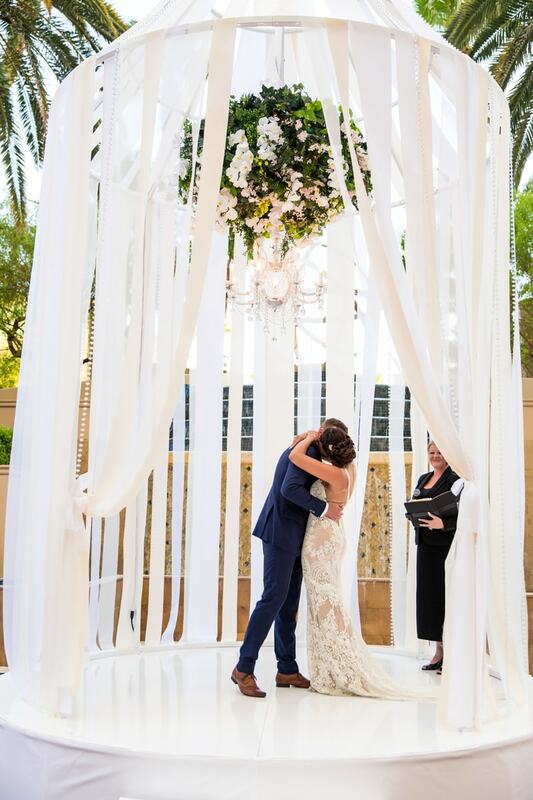 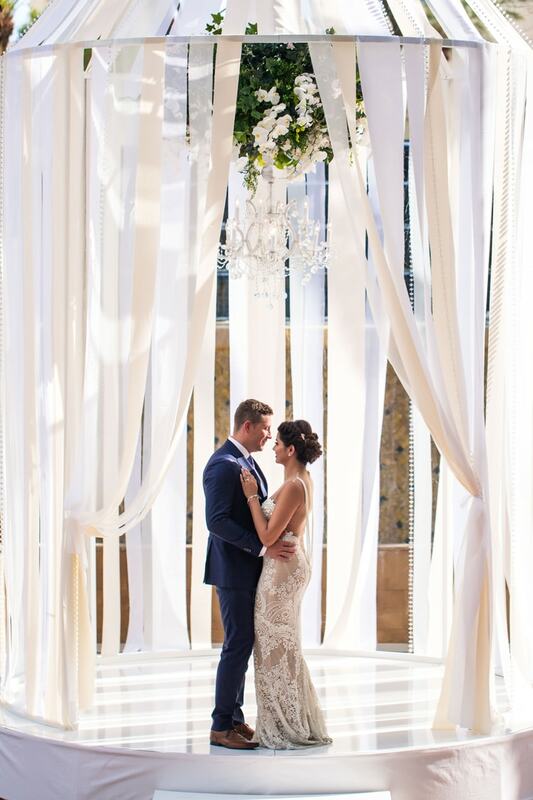 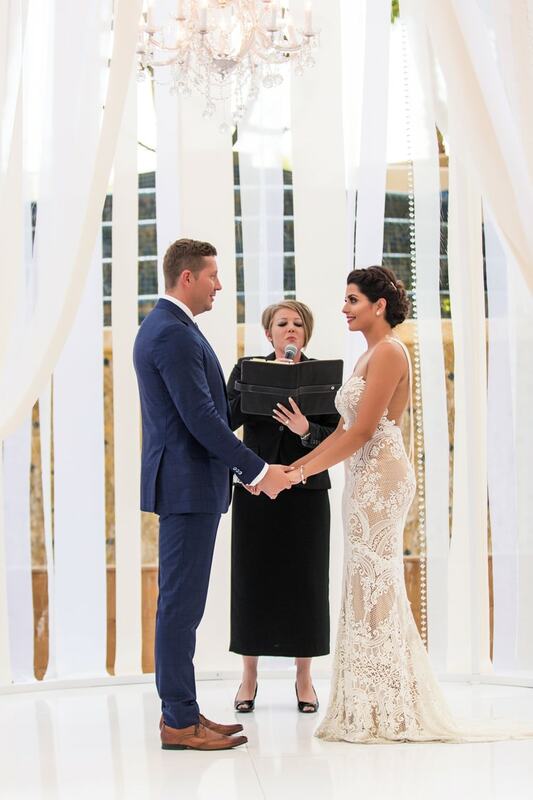 Once they were ready to officially tie the knot, their guests gathered around to watch them exchange vows under the most gorgeous flower dripped chandelier. 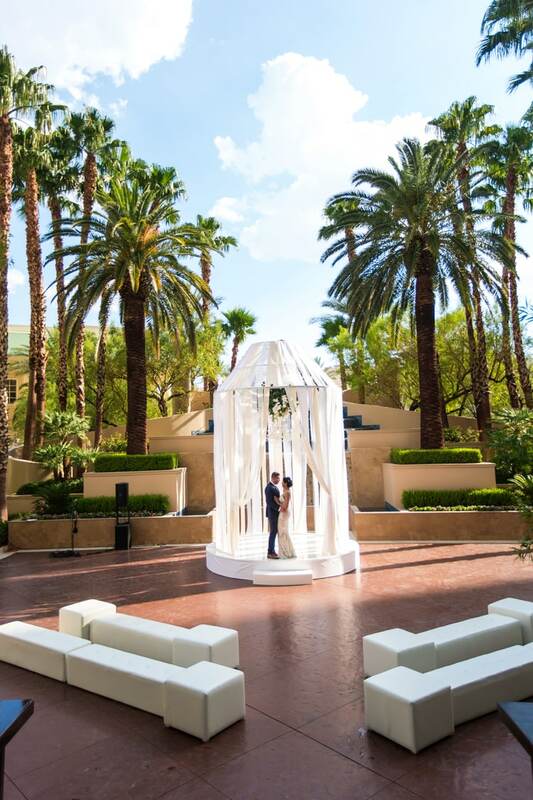 And just wait until you see their gazebo. 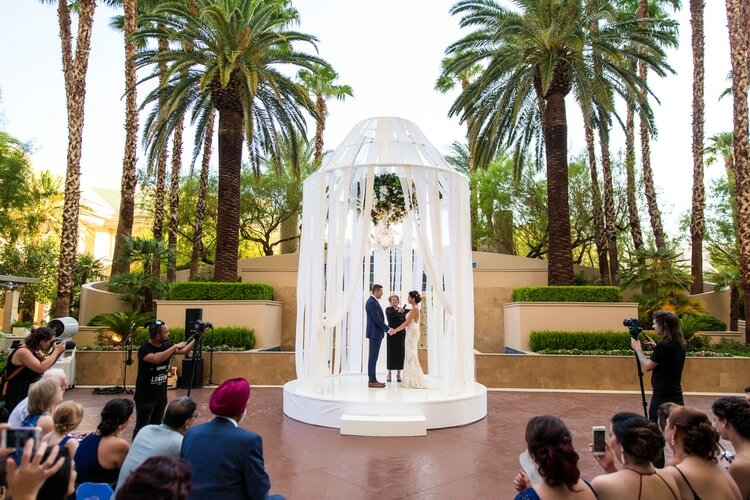 It’s a giant birdcage wrapped in flowing white ribbon! 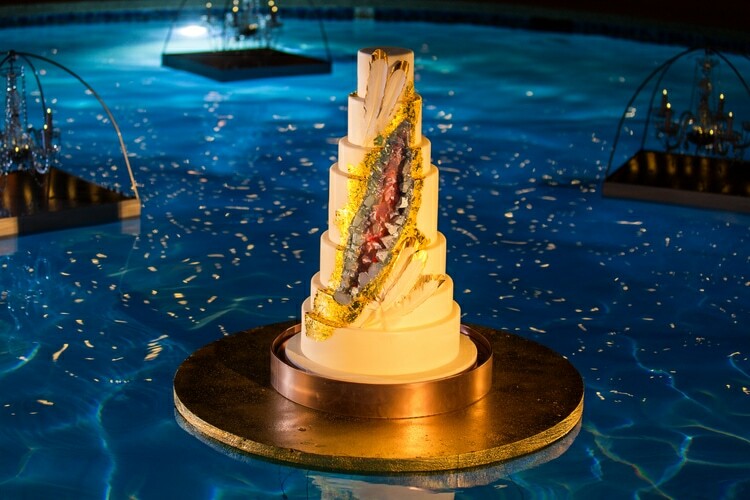 It’s breathtaking and quite possibly the most unique thing I’ve ever seen. 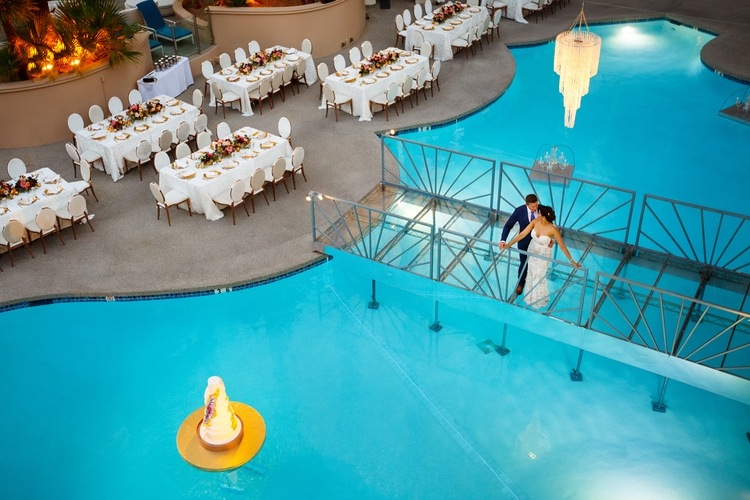 Oh, they also casually built a bridge to go over the venue’s pool, connecting both areas of the reception. 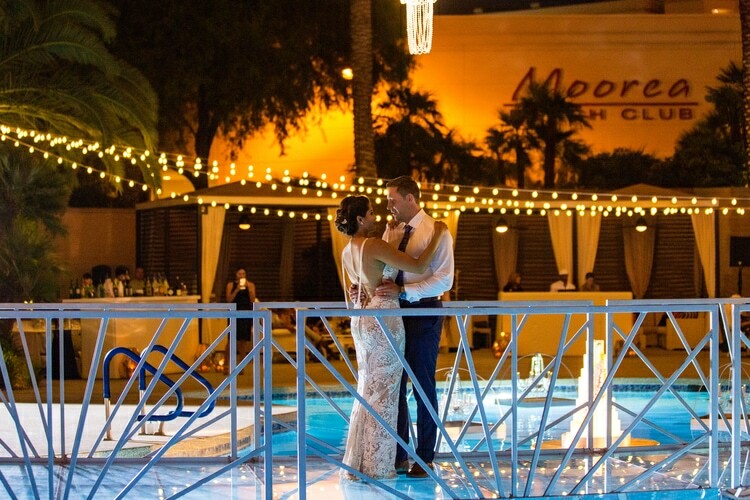 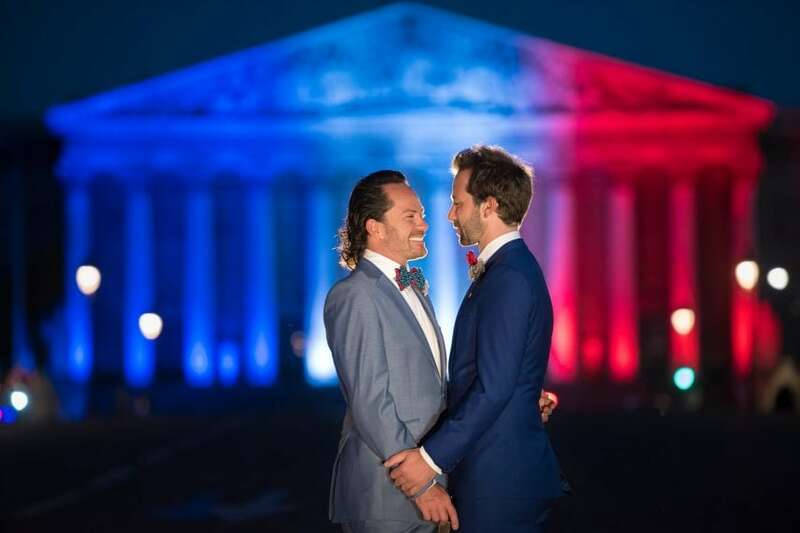 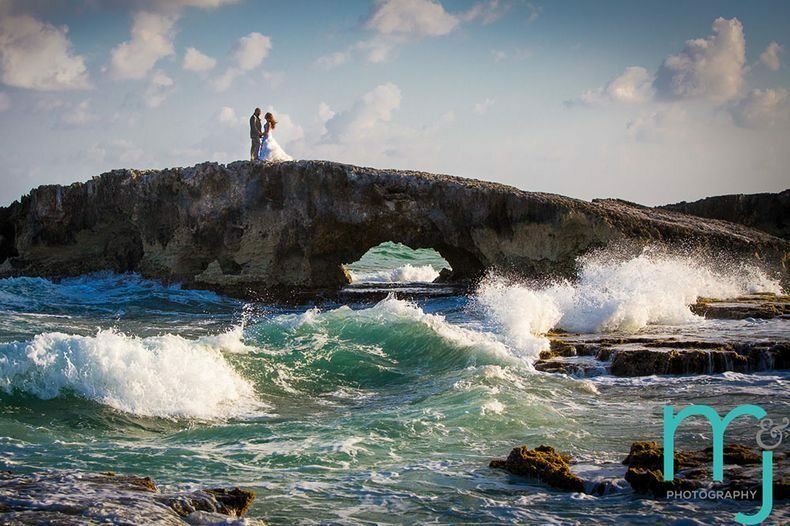 This is where the bride and groom had their first dance – to Elvis, of course. 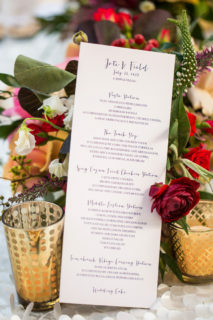 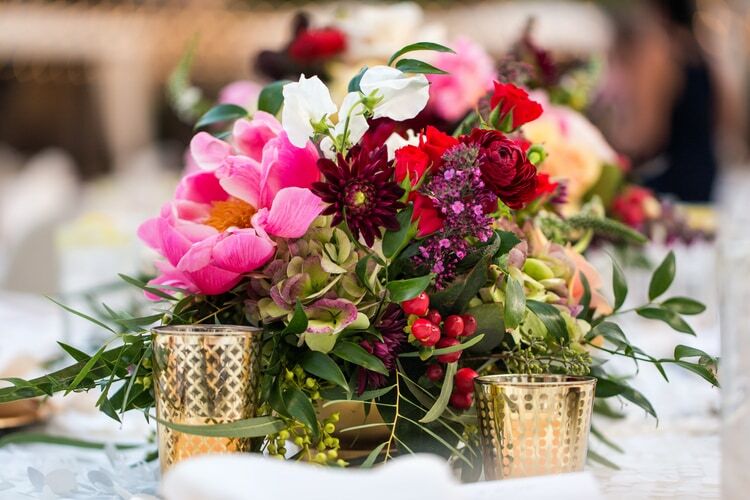 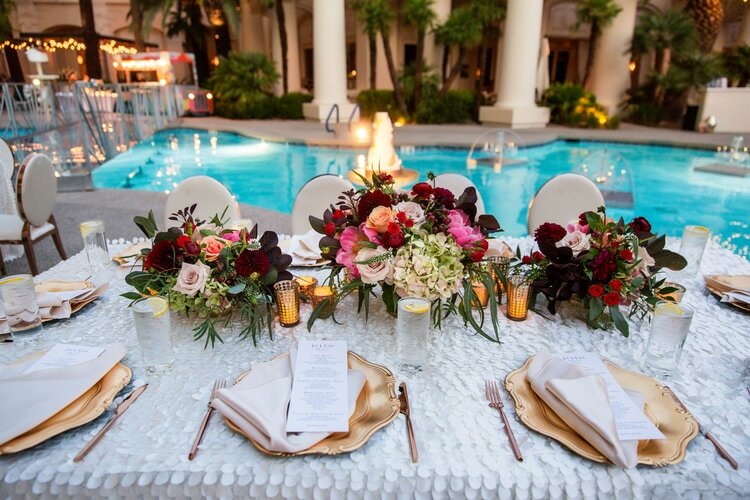 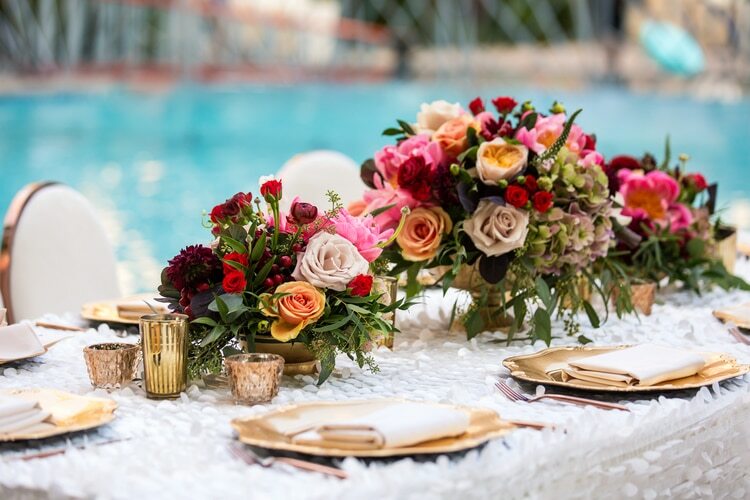 By adding textures with wooden tables, gold-rimmed chairs and glass orbs filled with jewel-toned florals, the team created a beautiful nod to the bride’s Indian heritage. 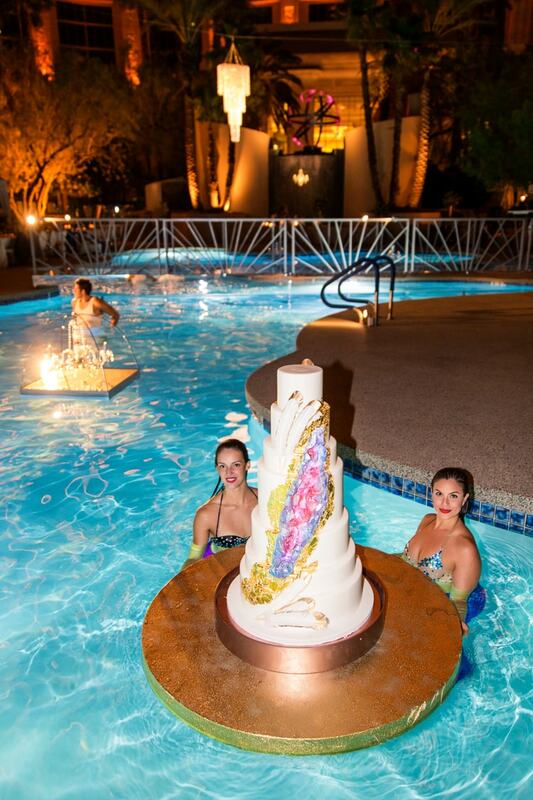 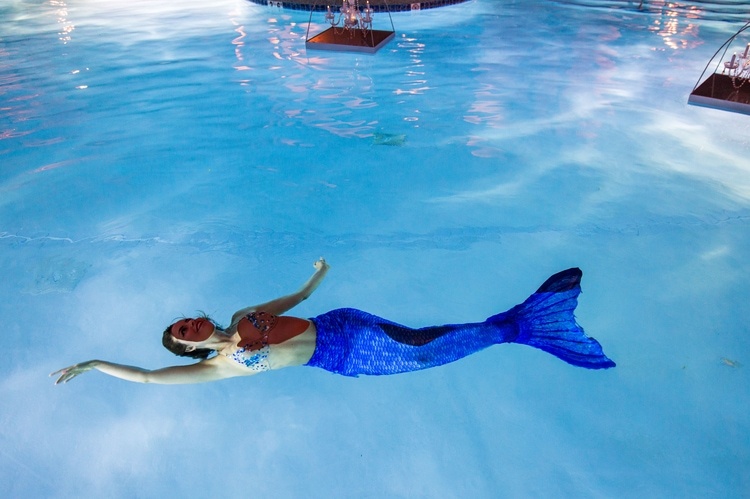 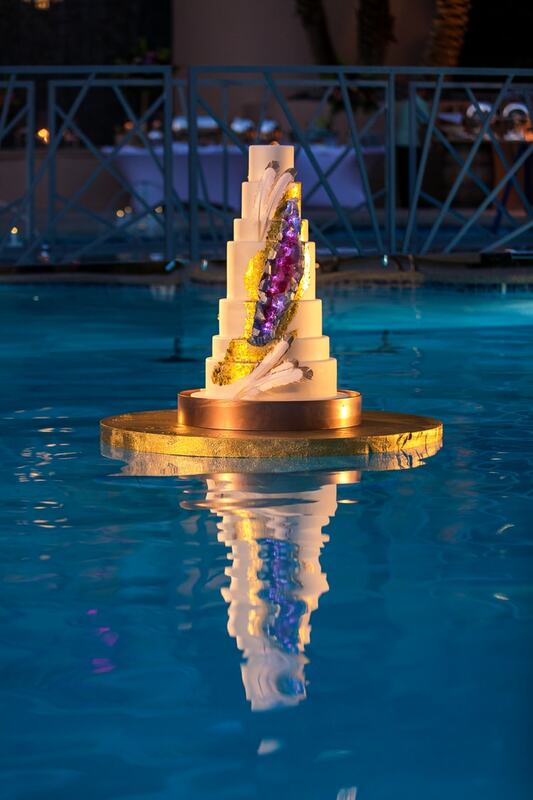 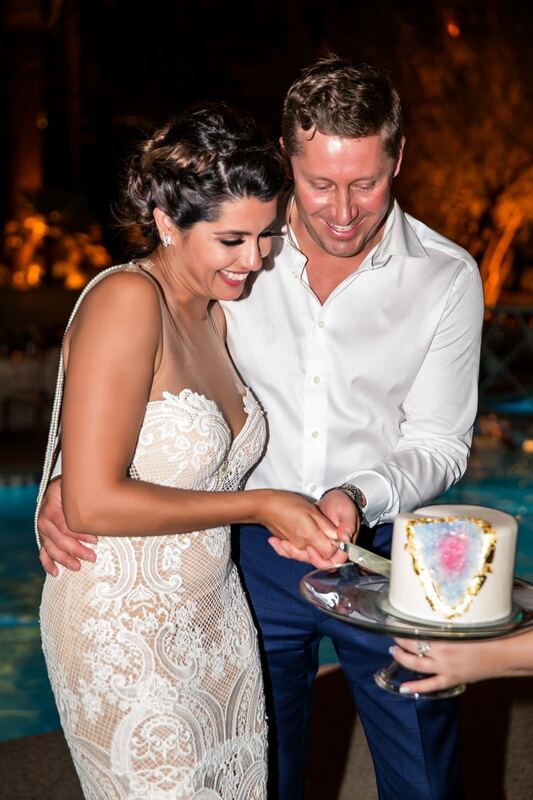 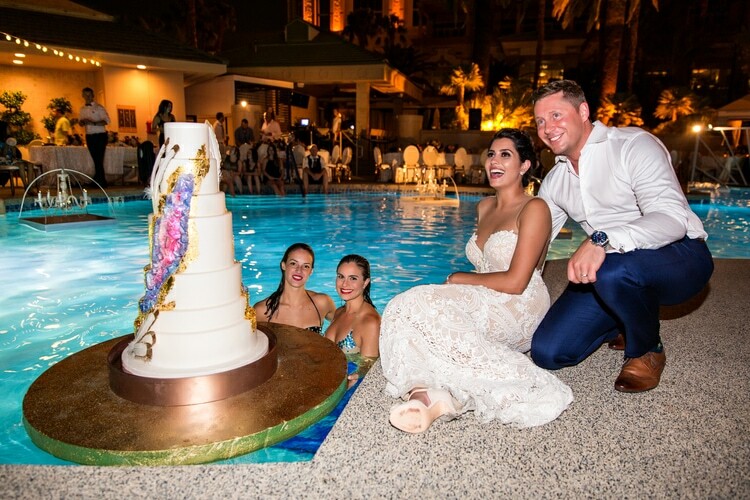 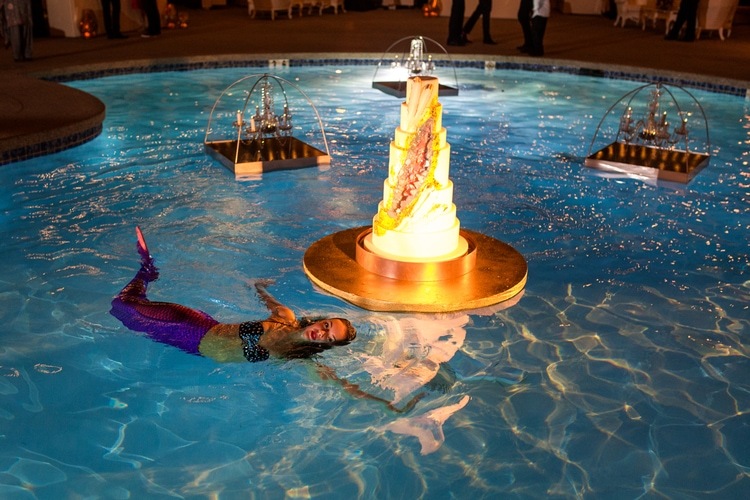 At the end of the night, mermaids brought an embellished, gold dripped geode wedding cake to the edge of the pool for the newlyweds to cut and their guests to enjoy. 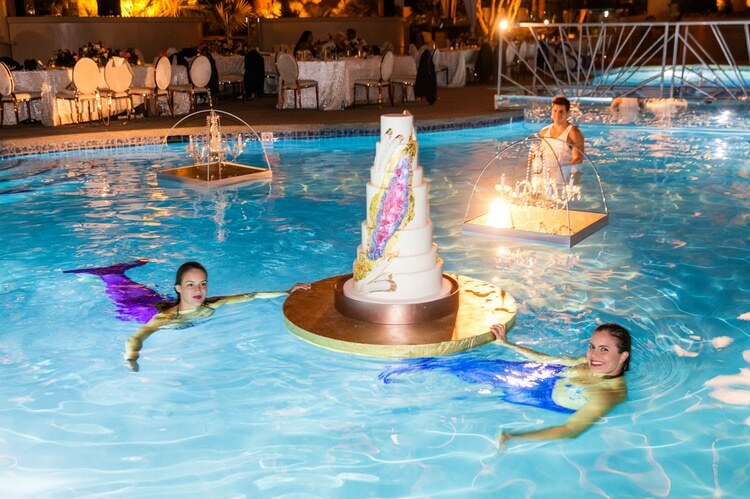 I know, I know, I’m hoping for an invite to their next party too. 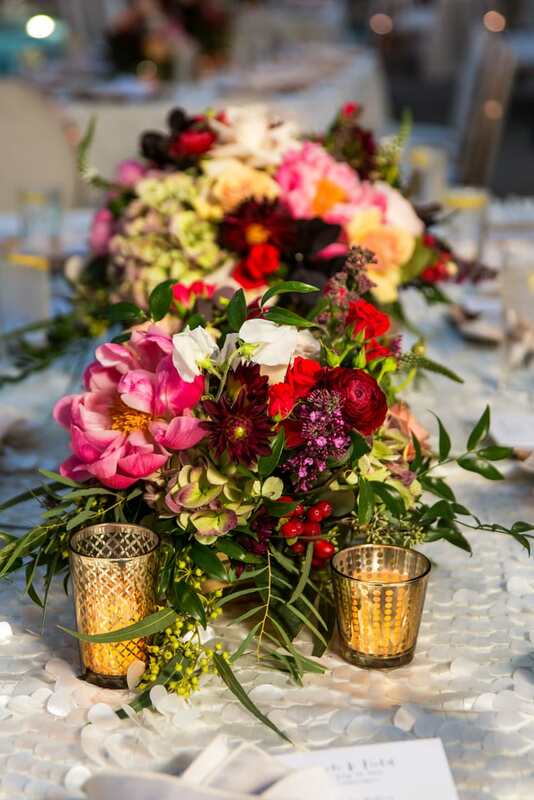 In the meantime, let’s just live vicariously through these gorgeous photos taken by Shandro Photo.